The impressive collection of instruments at Los Altos United Methodist Church in Long Beach is unique and rare. The organ is an authentic relic from California’s gold-rush era, as well as an important paragon of Mr. Simmons’ work as an organ-builder. The piano is an excellent example of a genre of limited-edition Steinways. The harpsichord exemplifies a fine museum specimen. God has blessed Los Altos! Resplendent both visually and aurally, the Simmons/Rosales/Bozeman tracker-action organ is a registered historic landmark with the City of Long Beach, and “has been selected for citation as an instrument of exceptional historic merit worthy of preservation” by the Organ Historical Society. It retains its authentic keys, bellows, wind chests, pipes, stop-knobs, and primarily the same appearance it had in 1852. It is the oldest extant American-built organ to be found west of the Mississippi River. California became the 31st state on September 9, 1850, the same month that the Howard Street Presbyterian Church in San Francisco was founded. By mid-1851 a new sanctuary was erected, and just one year later the novelty of a pipe-organ enhanced the worship services. The hand-pumped instrument was constructed in Boston under the skillful craftsmanship of Wm. B.D. Simmons. It was then dismantled, sent by ship around Cape Horn, and reassembled. In 1977, the instrument was moved to Long Beach and restored by Manuel Rosales and Associates of Los Angeles. Several tenor-clef stops were enhanced with bass octaves. The original 13 Subbass pipes were augmented to 30, and a 7-stop Pedal chest was prepared. 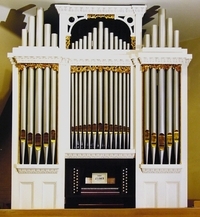 In 1993, a cooperative project by Manuel Rosales and George Bozeman incorporated tonal adaptation and finishing, and completing the Pedal division with pipework supplied by the Organ Clearing House. No documentation or photos provided information about the altered upper portion of the case, so Charles Nazarian designed a striking facade, with matching moldings and gilt carvings. John Ranney and Jon Martin were both influential in acquiring the organ and the piano. Details about the history of the 1905 “Model-C” Concert Grand Steinway Piano are unknown. Just the same, it is rare. Only 50 pianos of this unique 7’6” design were fabricated by Steinway in Hamburg. Prior to purchase, some alterations had been made to the piano. A restoration was carried out by Stephen Schell in 1981. He had a set of actual model-C strings in his possession, and was gratified to install them on a piano for which they were configured. The key action was also restored. The dazzling piano has a noble, rich bass and a clear, sweet, singing treble. It was the generous gift of Robert & Virginia Avery. The harpsichord was built in 1965 by William Krase. It is patterned after an Italian harpsichord built in 1665 by Giacomo Ridolfi, which is in the collection of historical instruments at the Smithsonian Institution. It is a single choir, with one keyboard and only one set of strings. It has 51 hand-carved maple keys, and the key-frame, music-rack, and outer-case are all made of walnut. The cypress soundboard generates a scintillating shimmer.